New cable is more fire-safe but more costly; usually it's used in new projects and some retrofits. But often the old is left beside the new. LOOK up the word "plenum" in Webster's New World Dictionary and you'll find it defined as a "space filled with matter." Look in the open-air--or plenum--spaces between floors in your office building and you're likely to find the definition holds true. Computers may have revolutionized how business gets done, but those helpful machines have their drawbacks. Countless mazes of data communication cabling (DCC) are running unseen in the areas above ceiling tiles and below floors in office buildings throughout the United States. In too many instances, plenum spaces are filled with matter, and that matter is a never-ending line of the cabling that helps make our companies run smoothly. Just how much cable is resting in the unseen nooks and crannies of our buildings? According to an NFPA task force's study, there are 60 billion feet of plenum cable installed in the United States alone. Much of that cable is outdated, unused, and no longer necessary. On the surface, it's a seemingly benign problem to have. So there's unneeded cable taking up useless space; what's the harm in that? The harm lies in the cable's ability to create safety hazards in the event of a fire and cause further fire and smoke damage to buildings and equipment. Some of the cabling includes combustible jackets and has high fuel loads. In short, the cabling itself helps to spread the fire. The large amounts of smoke some plenum cabling produces cause more damage to electrical and electronic equipment than the actual fire. Tiny conductive particles in smoke can short-circuit microelectronics and other components, destroying the equipment. That these cables rest in the air flow areas of buildings only exacerbates the problem. Air flow areas are of concern to fire safety professionals because they help spread a fire throughout a building quickly, especially if the fuel load of cables in air flow areas is high. According to an NFPA study, 126,000 non-residential structure fires caused $4.4 billion in property damage in 2000. NFPA 90A, the standard that governs cabling in plenum spaces, calls for cabling materials in plenum spaces to be non-combustible or limited combustible. But when the original ruling was issued more than 25 years ago, the technology was not available for manufacturers to produce cabling that featured the lower fuel loads and reduced combustibility of today's newer generation of cabling, according to Lori Alzamara, marketing manager for Communication Cabling Solutions at DuPont. Today, limited combustible cabling (LCC) is being produced to feature lower fire loads and improved smoke and flame performance. Problem solved? Not exactly. Older cabling, such as CMP conventional plenum cable, CMR (riser) cable, and CM (general purpose) cable, is up to code, but it can--and most often does--feature combustible jackets. This cabling also produces far greater amounts of smoke than the newer, fluorinated ethylene propylene (FEP)-insulated and -jacketed cabling now offered by most manufacturers. A study designed by architects, designers, cabling manufacturers, fire safety professionals, and material suppliers was recently conducted at the Building Research Establishment/Fire Research Station in Bedford, England, to determine how different plenum communications cabling responded in a fire. The test simulated a typical fire in a normal, open-office setting. Cables were installed in a steel ladder tray above a suspended ceiling. A one-megawatt fire source created in a wood crib was located below an open ceiling tile below the plenum space. The ceiling space was ventilated and smoke and fumes were exhausted. Four pairs of unshielded, twisted pair cabling were tested. The results were not encouraging. The study found CMR riser/CM cables performed the worst. They burned readily and produced large amounts of smoke. While both of these cables are up to code, researchers concluded that neither cable should be used in business-critical facilities. CMP cable fared better during the testing but still generated significant amounts of smoke and downstream burning. Researchers found that, while CMP meets the requirements of NFPA 90A and the NFPA 262 Steiner Tunnel cable test, it is not well-suited for business-critical facilities. The LCC jacketed and insulated with FEP (better known as Teflon®) outperformed the other cables by far. Testing found there to be almost no smoke produced by the cables during a fire--some 17 times less smoke than with CMP. LCC prevented any flame spread, and the overall fuel load was much lower. Separate tests were conducted for each type of cable with its jacket slit to simulate wear and tear. While each cable preformed slightly worse than if the jacket were completely intact, LCC still produced far less smoke and no increase in fire spread. If LCC is the best option, then the obvious solution is to use only LCC for data communications cabling in plenum spaces, right? While the thought makes sense, several obstacles stand in the way of making it a reality. Open up any ceiling tile in your office building, and you're bound to see why. As we update our communications hardware--our computers, fax machines, networks, digital telephones, Internet connections, etc.--we are constantly updating our wiring to handle the new equipment. While the old equipment gets sold, recycled, or trashed, more often than not the old cable remains in plenum spaces like forgotten relics. What results is thousands of feet of unused cable that, during a fire, could help spread flames and smoke through the building's air flow spaces. NFPA is beginning to take steps to reduce the risk. In the National Electrical Code (NEC) 2002 revision, NFPA stipulated that cable not tagged for future use be removed from plenum spaces. How much of unused cable is actually being removed is up to debate. "Abandoned cable is a fire hazard," says Alzamara. "The NEC 2002 standard says old cable must be removed unless it is tagged for future use. Some companies tag cable for future use, but, come on, they won't use it [in the future]." NFPA is aware of a company's ability to abuse the provision but has little if any power to stop a business from tagging its old cable for future use. "How likely is it that someone will use a specific cable again in the future? That's unknown," admits Mark Earley, PE, assistant vice president and chief electrical engineer at NFPA. According to Earley, there are no changes in terms of LCC in the scheduled revision of NFPA 90A in 2005, nor was there any such change in the last revision (2002). In essence, those cables that are shown to be in compliance with NFPA 90A, even though they have been shown to be a far greater risk than the newer generation of cabling, will remain up to code. The effectiveness of LCC is greatly reduced if it is packed into plenum spaces with older cable that will produce the additional fire and smoke that LCC was designed to reduce, which is why the material suppliers and cable manufacturers are turning to new developments and major renovations to spread the use of LCC. The message seems to be getting through. "Over the last year to year and a half, we've seen a major increase in the marketplace," says Alzamara. "Every major cable manufacturer now has LCC. It's not yet mainstream--the awareness is not where we'd like it to be--but almost every time we talk to an end user, the feedback is positive." As with any new technology, the bottom line is price. 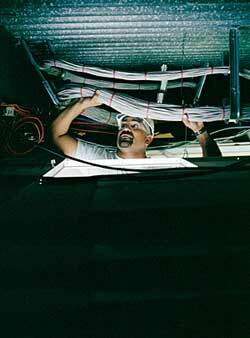 LCC is 30 to 50 percent more expensive than conventional plenum cabling. After installation costs are factored in, however, the price is only 8 to 10 percent higher, according to Alzamara. Despite numerous problems--old cables lying dormant in plenum spaces, higher prices, standards that view less safe cabling as compliant--DuPont officials believe the future is bright for LCC. "At the end of 2003, market testing showed that 10 percent of end users are familiar with [LCC]," Alzamara explains. "This technology has the support of end users; they're willing to pay for it. . . . In five to 10 years, we expect to see widespread adoption." Even if LCC does become commonplace in new ventures and major renovations, Earley says end users might face the same expensive dilemma they now face with other cabling down the road. "As the code stands right now, if someone uses the ultimate cable in terms of the latest technology, there's nothing saying they won't have to remove it in a few years if they're no longer going to use it." There has been talk about making LCC exempt from the removal provision in NEC 2002, but, to this point, there has been no significant move to do so. Whether those pushing LCC into the marketplace can convince end users to use a more expensive cabling that might have to be removed once it is obsolete--just as with any other plenum cabling--remains to be seen. Material suppliers are banking on LCC's far superior safety performance, in terms of lower fuel loads and smoke emissions, to help it overcome obstacles in the marketplace and get into new and renovated buildings. "Businesses will upgrade electrical cable every five to seven years," says Alzamara. "We want them to realize they can use LCC to increase their bandwidth and decrease their fire and smoke hazard."